UPDATE: Lost Art #6 has been found! When I was visiting my hometown for the holidays last week, I was happy to discover that one of my Lost Art paintings from last year had found itself a home! One of the guys who lives on Crystal Street had picked it up and carried it into East Stroudsburg Hardware (the store that figures prominently in the painting) and given it to the owner, Jim, who now has it proudly hung on the front of one of his glass display cases. When I heard he had it, I went over there to introduce myself. It turns out that Jim is a big supporter of local artists and has several other paintings and pieces of art in his store. I'd been driving past his place for years and hadn't even known! He said that he would have gladly written in to the blog, except that he doesn't use the internet very much and wasn't sure about the address. So I'm very glad that the word got back to me that the painting had found an appreciative home. And I'm glad I was able to find Jim over the holidays and thank him for looking after it! Here are some pics I took of Jim and of the painting where it now hangs. Another Lost Art is found! I'm excited to announce that this week, Lost Art makes its first official appearance in the United States! 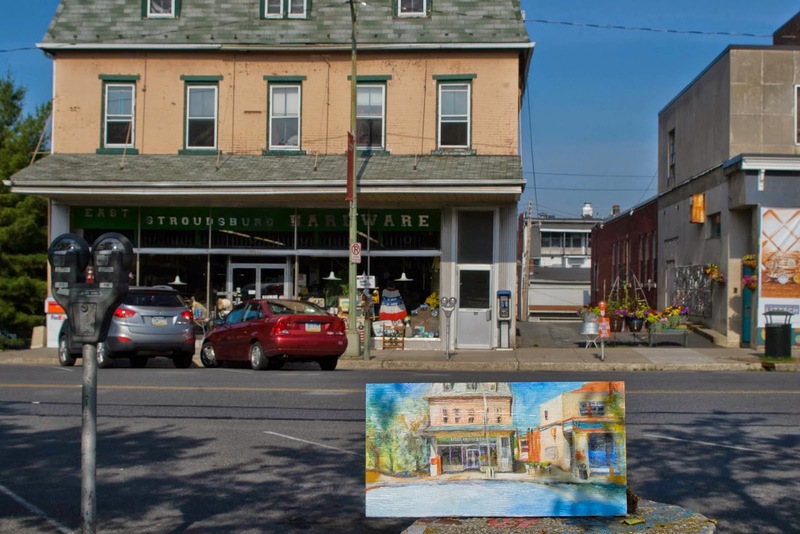 This morning, the sixth painting in the series was left on Crystal Street in East Stroudsburg, Pennsylvania. I'm looking forward to hearing from whoever finds it! And keep your eyes open over the next few days if you happen to live across the river in Stroudsburg, or down the road in Bethlehem, as these are among the locations I'm considering for Lost Art number seven. 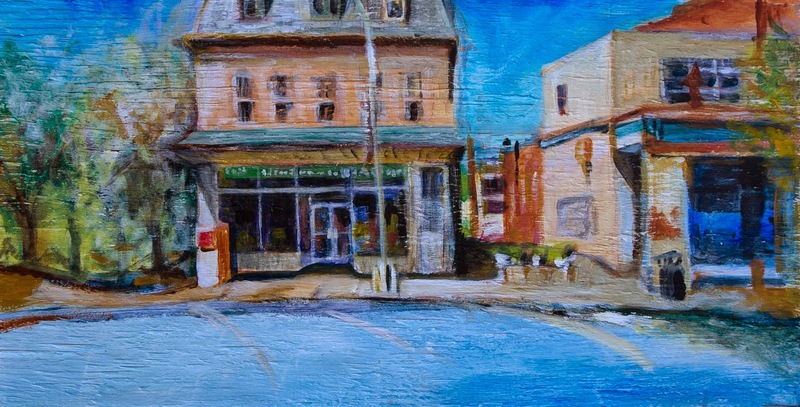 This painting, acrylic on found discarded wood, 22 1/2" x 11 1/2", was left on Crystal Street in East Stroudsburg, PA, across from East Stroudsburg Hardware on June 17, 2014 at 9am.